Designed primarily for “Poster” larger image sizes, the 62 LPI lenticular sheet also works well for smaller premium-class products, such as ISO credit cards. The lens sheet design is very effective when printed using lithographic offset reproduction equipment. This product is also suitable for high resolution digital printing. We recommend this sheet for 3D imaging as well as flips and animations. 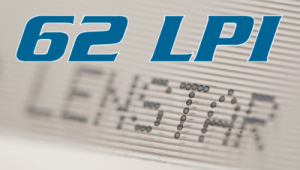 Designers often choose the 62 LPI Lenstar®Plus lenticular sheet for volume POP displays and signage (point-of-purchase applications), where it provides a very high degree of effectiveness.